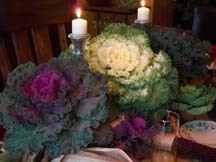 My Thanksgiving table came alive with color and drama thanks to a few hardy heads of ornamental kale. What a showstopper. Grow it next year people. I had heard tales that it could take temps that got down to 20 degrees. Then I also heard that it could go to 5 degrees. Actually I thought that it would just be frozen. 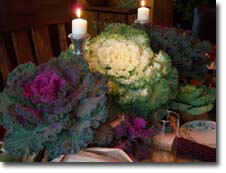 I waited and watched the little ruffles of color every day, hoping they would be perky when Turkey Day came around. And they were. They aren’t much to look at all summer, until the coolish nights of about mid-September. I bought numerous packs of the little sprouts at the Cub Foods hoop hut clearance sale at the tail end of June. To do it again, I would put more in pots. They are a treat for the bunnies.